Change happens – I can be involved and active in its direction, or I can watch from the side as it moves and twists around me. Either way, change still happens. If I want to effect the change of my life, then I MUST show up. I will never have any say in my direction if I never show up. My life will just be. I win half the battle by just showing up. Showing up provides momentum. It reveals determination. Showing up paves the way for so much more for my life and in my life (and sometimes through my life). Showing up can often prove to be one of the most difficult tasks I will face. I can get to a place of just showing up if I follow fives simple steps. What I think about will become my actions. “I hate getting up early.” “I am too tired to do this.” “”I can wait just a little longer.” These and similar thoughts or sayings will lead to me sleeping in, to me being too tired, and to me continuing to wait. My actions follow my thoughts. I worked for a man that had the staff meet each morning and shared the positives about what went on the day before and also to get guidance from others with any struggles. We ended each meeting changing – or more like shouting – “I am happy. I am healthy. I am terrific.” We did shout it each time and the level and enthusiasm rose with each pass. We came away feeling happy, feeling healthy, and feeling terrific – or at least we were a little better than when we had started. I will never get anywhere if I stay where I am. I have to move. I have to go. I have to do. I watch the transformations of the lives around me and I “wish” for my own transformation. Until I put legs on those wishes, I will be stuck in place of “it might have been” and “if only.” I have to get up if I am going to get going. Step THREE: Take a breath. Moving to change stirs up stuff – and stuff usually drags along fear, frustration, or anxiety in one form or another. A deep breath calms the heart. A deep breath focuses the mind. A deep breath feeds peace to the spirit. Calmed, focused peace provides the clearing needed for that next step to occur. Step FOUR: Close the eyes. Change looks like nothing I have ever seen or dealt with. “I have never done it that way before” can often be the eight scariest words in the history of the world. Closing my eyes blocks out that vision. I keep my heart’s eyes looking at the goal and not the stuff of the world. Closing my eyes stops the invasion of the impossibilities. Besides, it is much easier to jump into the unknown when I am not looking. Step FIVE: Take a step. I will never arrive if I never start. Every journey, every achievement, and every accomplishment in life began with the same thing – one step. 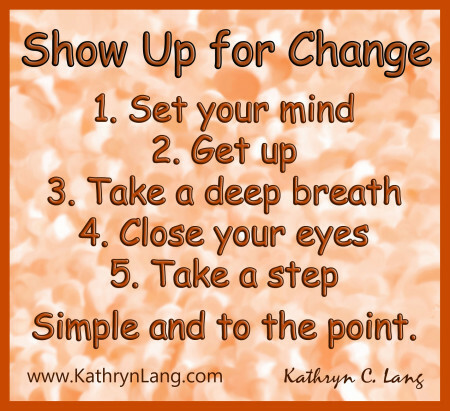 Change happens, but when I determine to just show up then I begin directing the change for my life. Today on Growing HOPE Radio, I was blessed to visit with CA Marks from Moxie Beautiful and Constance Smith from Cosmopolitan Cornbread. We shared laughter. We shared our journeys. And we inspired each other to first just show up and then to keep on going.